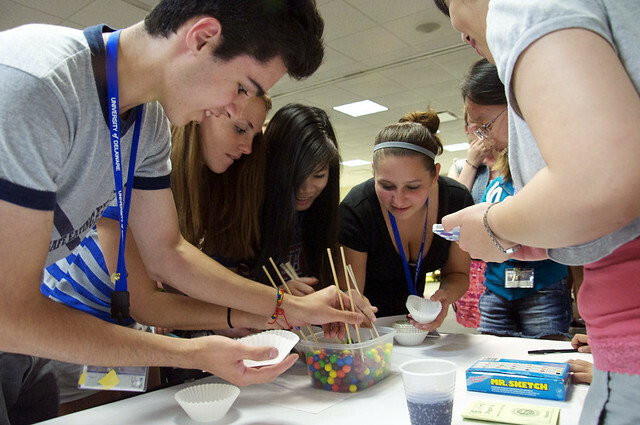 In collaboration with the Delaware Governor’s School for Excellence, the Confucius Institute at the University of Delaware (UDCI) presented a “China Night” program for more than 120 Delaware high school students on Thursday July 19, 2012. It is the second year that UDCI organized the “China Night” program for the Governor’s School for Excellence. This year’s theme was “Dragon Up“, signifying the year of dragon (2012) in Chinese culture, as well as the program’s participants – a group of promising high school rising juniors, who represent their schools for their extraordinary abilities in scholarly studies, art, music and theatre. At 6:00 pm in the evening the Governor’s School’s students lined up in the hallway in Pancader Hall on UD’s north campus, each receiving a “passport” to register various cultural activities to experience and tasks to complete during the program. “China Night” started with a brief presentation by the program organizer, including a 10-minute video about China, followed by several performances including Chinese folk dance, Kung Fu, Music, Chinese painting and calligraphy demonstrations. In the next two hours, the students were divided into six groups to experience six Chinese culture categories of music, dance, painting and calligraphy, food, martial arts, and games. They competed individually in each category for their knowledge of Chinese culture and for successfully completing related cultural learning tasks. Students with the highest scores collected on their passports were awarded with Chinese-style souvenirs and prizes. 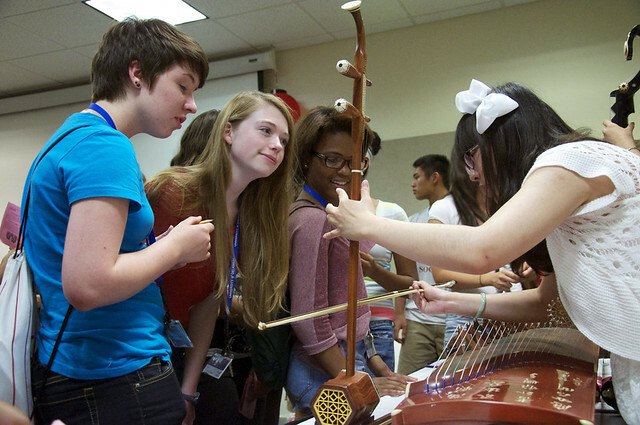 This year the Confucius Institute staff introduced four different types of traditional Chinese music instruments, including Chinese zither (Gu Zheng), Er Hu, flute and Hulusi to students and for them to experience and learn. Members of the Dragonfly Dance Club, a registered UD student club, performed at the beginning of the program a traditional dance, which was inspired by a famous poem written 1,300 years ago in Tang Dynasty. Students also had a lot of fun trying to match up dance costumes from several ethnic minority groups in China, such as the Tibetan, Yi, Miao and Dai. Students watch UDCI’s staff play Er Hu, a popular traditional Chinese instrument. 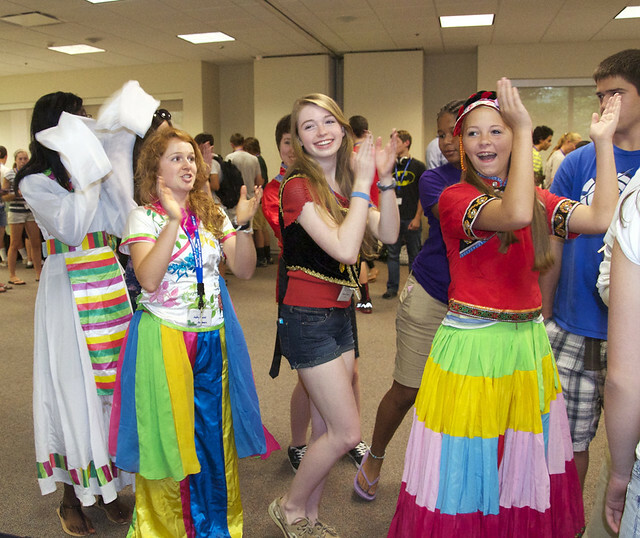 Governor’s School students dance in Chinese minority groups’ costumes. 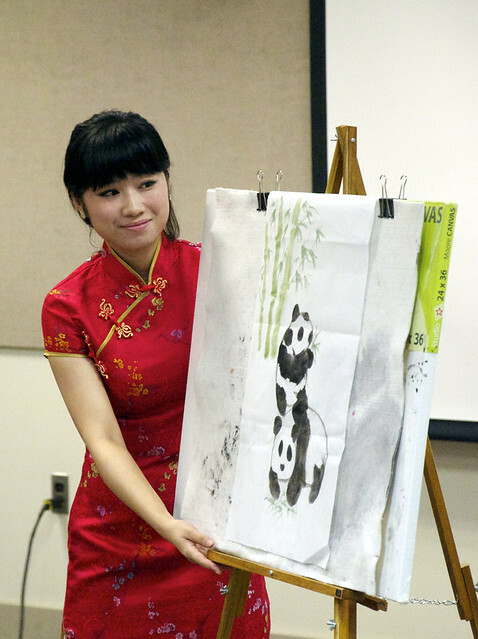 In the painting and calligraphy section, students learned to draw pandas and bamboos using water and ink from Ms. Ye Yan, a visiting scholar from Xiamen University in China. They also applied their knowledge of the Chinese language to the writing and guessing of simple Chinese characters by practicing the use of Chinese brushpen with Ms. Chang Gao, CI’s student assistant. 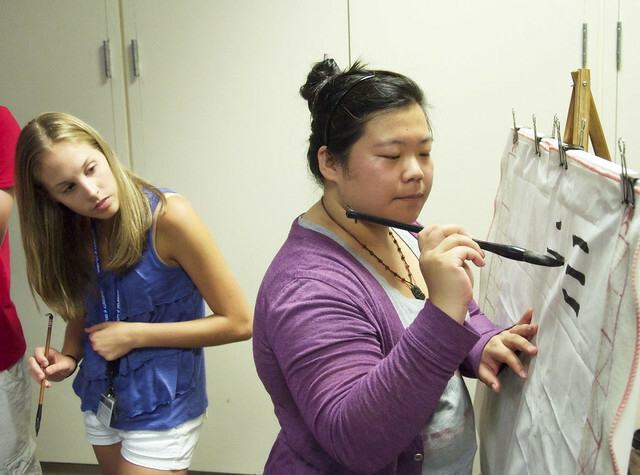 Student watches Ms. Chang Gao, UDCI’s student assistant, write Chinese characters using brushpen. Martial Arts demonstration was presented in the hallway as students needed more space to do Taiji poses and practice the combat style Shaolin Kung Fu kicks. Students learned to appreciate the essence of Chinese martial arts – a harmonious co-existence of the hard and the soft, an art of opposing and yielding, from the martial arts instructors Mr. Adrian Lee (Kung Fu) and Ms. Tingting Sun (Taiji). Students follow Ms. Tingting Sun, UDCI’s visiting volunteer teacher, to perform Taiji. Chinese food corner was surrounded by crowds of students who were learning how to make traditional Xiamen style spring rolls and edible “flowers” with cucumber, carrot, radish and oranges. 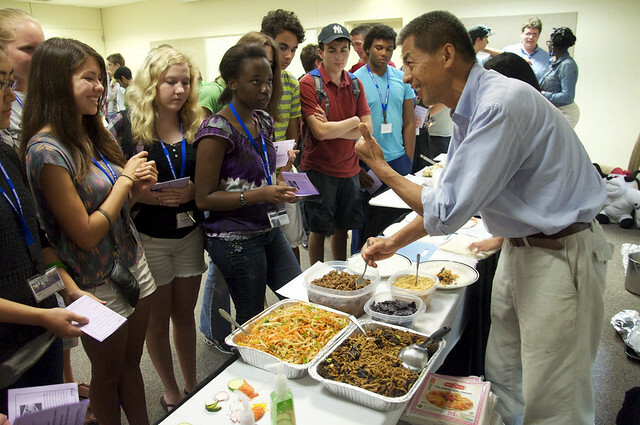 Mr. Walter Hu, UDCI’s friend, introduced Chinese food to all students. He made the food for the program. In the Chinese game section, students competed with each other in their skills of using chopsticks and targeting at a two-dragon-playing-with-a-pearl graph drawn by Yizhu Tang, a Confucius Institute student assistant. Students use chopsticks to pick up M&M beans. The program ended with a quick fire questions session where students distinguished loan words in the Chinese language from English and recognize the Chinese elements which appeared in popular American films. Students enthusiastically participated in the session as it was the last chance for them to win bonus points on their “passports” for prizes. “This is something that’s really fun. 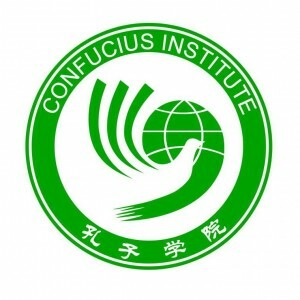 I didn’t even look at my watch in the whole three hours,” one Governor’s school student told Ms. Carrie Fang, program coordinator of the Confucius Institute and the organizer of the event. More than twenty UD students, alumni, visiting scholars and friends of the Confucius Institute participated in the program, contributing to the success of “China Night”. 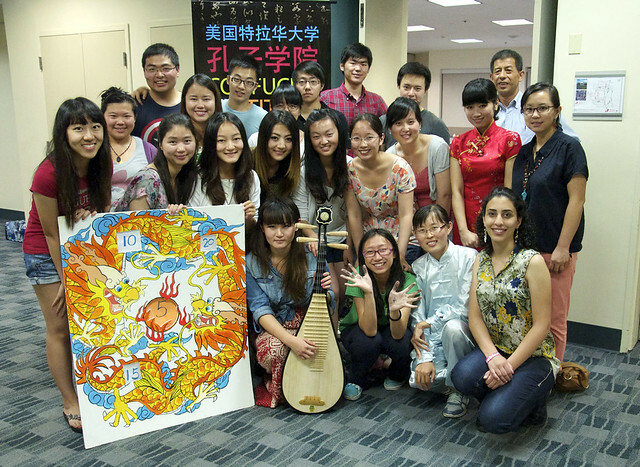 Staff and student members of UDCI worked at the “China Night” program.